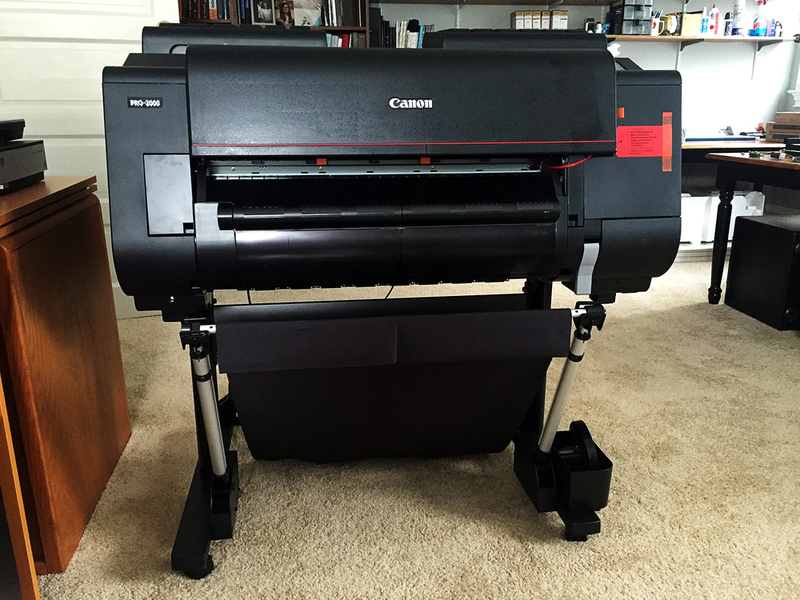 Way back in August and September of last year I wrote a four part review of my new Canon ImagePrograf 2000 wide format printer. I had bought the new printer following three print head failures in two Epson 7900 wide format printers over several prior years. Therefore, I think it is only fair that I provide a follow up to my Canon review (you will see what I mean shortly). The print quality of the ImagePrograf 2000 has been excellent, both in black and white and in color. I have not done formal testing of any sort comparing Canon to Epson, but I can say that, to my eye, the print quality of the Canon is every bit as good as the Epson. If one reads reviews on the internet you can learn how one machine handles a specific color a bit better than the other and vice versa. But the bottom line is that both brands make professional level printers that are capable of producing excellent quality prints in both color and black and white. I could quibble a bit with the method of loading sheet paper in the Canon. The Epson method is easier (at least in their wide format models) but it's no big deal really. I also find that if one is using thick art paper in roll form that the auto paper load for rolls often fails.....but, no matter, you can still load it manually quite easily. But here is why I thought I needed to add a part 5 to my review of the Canon ImagePrograf 2000. I had an early head failure after approximately 8 months of using the machine. There was loss of small segments in the nozzle check pattern of the yellow channel that would not come back with multiple cleanings, though I have to admit it was hard to tell there was a problem in the prints. Nonetheless, I could not restore a completely normal nozzle check pattern. Shades of the Epson 7900, though head failure in the Epson's always led to visible banding on prints. Here is the difference though. With the Epson (once off warranty), the cost to replace the head by an authorized repair person (which was only guaranteed for 30 days post replacement if I recall correctly) was enough that you might as well toss the whole machine and buy a new one. Plus, besides the frustration, I also needed to pay a mover to get a new replacement machine where it needed to get to. All in all, an expensive proposition. The Canon experience was different though. First of all, the machine was still on warranty and Canon had no problem sending me a new print head. So no scheduled repair people, no need to be home, no need to see your printer dismantled and lying in pieces. If the machine wasn't on warranty the replacement would cost a not insignificant $675, but still dramatically less than a replacement printer. And forget the inconvenience of needing a mover like I did when the Epson needed a new print head and I had to replace the whole thing. And here is the best part.....replacing the print head was EASY. It took about fifteen minutes without having to undo as much as a screw. Just set the menu to replace, open two latches, pull the old print head out, drop the new one in, close the two latches and you are good to go once the machine does an auto adjustment and color calibration. Problem solved. Yeah, it was a little discouraging that it occurred so soon, and I did choose to redo my paper profiles (which cost me some time), but I'm back making beautiful prints again without having had to experience major hassles! Rather than give a detailed review of the Canon ImagePrograf 2000 printer, I am going to give my impressions on the ease of use, the options, and the subjective print quality. For an extremely detailed look at the printer, and certainly if you are considering purchasing one, I recommend that you have a look at Keith Cooper's very detailed and extraordinarily well done printer review here and here. So how do the prints look? This is obviously going to be very subjective, but I think they look great. I have not done any objective quantitative measurements, but, to my eye, they look every bit as good as the prints I was getting from my 7900. There are a couple of little glitches I do want to mention though, and they have nothing to do with the ultimate quality of the prints. The Canon print driver does have a few, shall we say, quirks. For starters, when using cut sheets the printer requires a 3mm margin around the top, left, and right side of the print.....but a 20mm margin is required at the bottom. Using the "Center Print" checkbox in the driver or in the Photoshop print dialog centers the print not to the center of the physical page, but to the center of the printable area with the asymmetric margins. The long and the short of it is that your print is never centered on the page itself! Really?? Who thought that was a good idea? There is a workaround though. In the Photoshop print dialogue tick the 'Center Print' box and see how many mm down from the top of the page is listed there. Then uncheck the center print box, add 9mm (0.354 inch) to the listed distance that the 'Center Print' dialogue had given you and fill that number in as the distance from the top of the page to place the print. Your print will now be centered on the physical page as opposed to centered in the printable area. Just make sure the entire image fits in the printable area (you can tell on the preview image in the print dialogue) as there is still a need for that 20mm margin all around..
Another alternative is to install Canon's Print Pro Photoshop plug-in to print to cut sheets. This will allow you to print in the physical center of the sheet for cut paper without the asymmetric margins. The reason that I have not used it is that the plug in does not allow black point compensation as part of its rendering intent. But if they can center prints using their plug in why can't they do it for their main print driver. I should note that the centering issue doesn't exist for roll paper, only for cut paper. Quirky! In fact, the printer is clearly optimized for printing on roll paper. Loading a roll is pretty simple and straightforward. You can print on cut paper, and I certainly intend to, but it is a bit 'clunky' to do so. There is no top or external feed for cut sheets. You load sheets by opening the printer cover, opening the release lever, sliding the sheet under a portion of the platen, lining it up with several markings, closing the lever, and then closing the printer cover. Works perfectly, but it's definitely a bit awkward. And I wish there were a better lock or something of the sort to hold the cover open while doing the paper loading. It is made to stay open, but it just doesn't feel that securely held open in place. In fact, it did close on me on one occasion. Of course, the print is the final product and they look great! There is also a nice array of additional software that can be downloaded at no cost. This includes the Photoshop printing plug in I mentioned above, accounting software that can keep track of the costs of your paper and inks, as well as various types of layout software. Of particular interest, though I haven't had a chance to use it as of yet, is the Media Configuration Tool, which allows you to customize third party papers in terms of optimal paper feed, ink density, etc and export the settings under a name you choose right into the printer driver. Pretty neat! 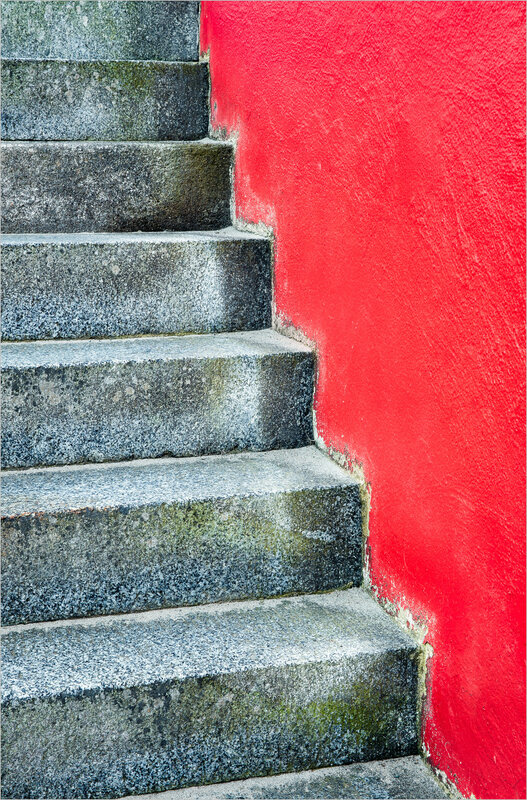 Moving the printer to where it needed to go required turning it onto its side and lifting it vertically to get it up a narrow and winding staircase. There is no problem doing this (assuming one doesn't drop the nearly 200 pound device.....between the weight of the printer and the size of one of the two the fairly burly people doing the moving, one of the wooden steps actually broke) as long as the printer is new and not charged with ink. Once filled with ink you would do well to keep the printer fairly level. Reading the setup manual that came with the printer made me a little nervous, as it sounded like it might be a bit complicated. There were three items that worried me. Most concerning was the bit about installing the printhead by yourself. Ah, that printhead......the Achilles heel of my old Epson 7900! Second, the ink cartridge insertion levers seemed far more complicated than my old Epson, where you just pushed the cartridges into the slot and were done with it. Finally, there were some adjustment parameters to be made. Well, as it turns out, the whole setup process was actually very simple. In fact, you could pretty much do it by simply following the directions that the printer itself gives you on its LED control screen. The screen tells you what to do step by step, along with images of what you should be doing. My concerns really were unfounded. This was very nicely done by Canon! As it turns out, the oh so delicate printhead was extremely easy to insert. You simply open two lever locks, drop it in, and close the two lever locks. That's it! If you can manage to get it from the package to the printer without dropping it you are good to go. That was no easy feat despite the fact that it only weighs a few ounces considering that I just knocked my coffee over onto the keyboard of my laptop while I am typing this.....really!! How the laptop is still working must be a miracle. Lastly, the printhead adjustments......nothing to fear. They are all automatic. All you have to do is feed the printer paper (supplied with the printer) when the LED panel asks for it. Once again, the process was really quite easy and required no user 'decision making'. The printer offers various options for connectivity including USB (2.0), Ethernet cable, and wireless. Since it sits right next to my computer and I intermittently have problems with my router I simply connected via USB. One thing that is very nice is that once connected you simply open your web browser and type in a URL that you are given and are presented with the latest driver to install along with a nice array of software. This includes accounting software that lets you keep track of the cost of your printing, a media configuration kit that lets you put together printer settings for custom media (I mostly print on third party papers) and several other useful programs. My next (and final) installment of this review will talk about using the printer (including an annoying quirk) and the admittedly subjective quality of the prints (spoiler....the print quality is really superb to my eye). As I have mentioned in prior posts, after my Epson 7900 wide format printer died (again) I decided it was time to switch printer brands and ultimately decided to replace my Epson with the new Canon ImagePrograf 2000 wide format (24 inch) printer. This new printer is based on technology in the ImagePrograf 1000 printer, which has been out for months, and has received very good reviews. I have not been able to find any reviews of the ImagePrograf 2000 on line, so i thought it might be of some use for me to do a review of my own. However, because of various commitments which don't give me much block time until mid August, I won't be 'firing' up the printer until then. I don't think learning a new device such as this should be done in short random increments. However, at this point I have unboxed the printer and had it moved up two flights of stairs. So I can talk about that now and return for more installments once I get the machine working. Be prepared.....making the jump from a 17 inch to a 24 inch printer is a huge step that encompasses more than just another seven inches. The printer was delivered by a lift-gate truck on a wooden palette. This 'big boy' weighs in at 300 pounds (including the palette) when fully packaged, though the printer itself 'only' weighs 185 pounds. The truck drops the palette on your sidewalk. Period. That's it. The rest is all up to you. You need to know what you are in for if you are a private individual, as opposed to a printing firm with a storefront. So the first challenge is getting a 300 pound wooden palette into your home. In my case it involved getting it up two stairs at first, down a walkway about 15 feet long, and then up another 9 or so stairs and through the front door. Luckily my home is old and has a very large front door. Otherwise it would have to be unpacked and brought in without the packaging. Not good if it happens to be raining on the delivery date. So how did I fare? Well, I arranged for the delivery to be on a day when my 22 year old son was home and I planned to see if the truck driver would help me if I paid him a bit on the side. In the past some drivers have been willing to help while others are not. Luckily, this one was. He had a palette lifting fork that could lift the palette about two inches off the ground. This was just short of getting the edge of the palette onto the first stair. But it did let two of us grab the edge of the wooden palette and get it onto the first stair while the palette lift was being removed. The three of us were then able to lift it onto the walkway, slide it forward, and then use the palette lifter to roll it down the walkway to the 'real' set of 9 stairs and to where the big challenge was. The three of us could not simply lift the palette and walk it up. Even if we could lift a combined load of 300 pounds, it is just too big and bulky to be able to balance. With four people maybe. Maybe. My other concern is that the palette is meant to be lifted via fork lift, which supports the palette under its entire length. When people lift it, they hold the wooden palette by the edges which means that the weight of the device is borne by the unsupported center. With the ImagePrograf 2000 this was fine and the palette held up. I would be pretty concerned though if this were the ImagePrograf 4000 48 inch printer. I believe that palette, when delivered, weighs in at about 450 pounds. That would have been essentially impossible to get up stairs and even if I had many friends help I don't know if the palette, held at the edges, would have held up without breaking. Perhaps it would have. So here is how it worked. Two people at one end of the palette lift and pull while the person at the rear pushes, in order to slide one end of the palette onto the stair and rest. Repeat. Nine times. At the bottom of the picture you can see how this type of activity actually broke a piece off the bottom of the palette. Then, at some point the entire palette is at a steep angle and the person in the rear has to ensure it doesn't slide down. Once it gets onto the top step lift from the back and push to get the palette onto the landing. Then tilt an end up and get a throw rug under the palette. Pull the palette into the house on the rug to protect the floor. We're in! Sydney, the cat, halfway down the right side of the picture, was totally unperturbed by the whole process. 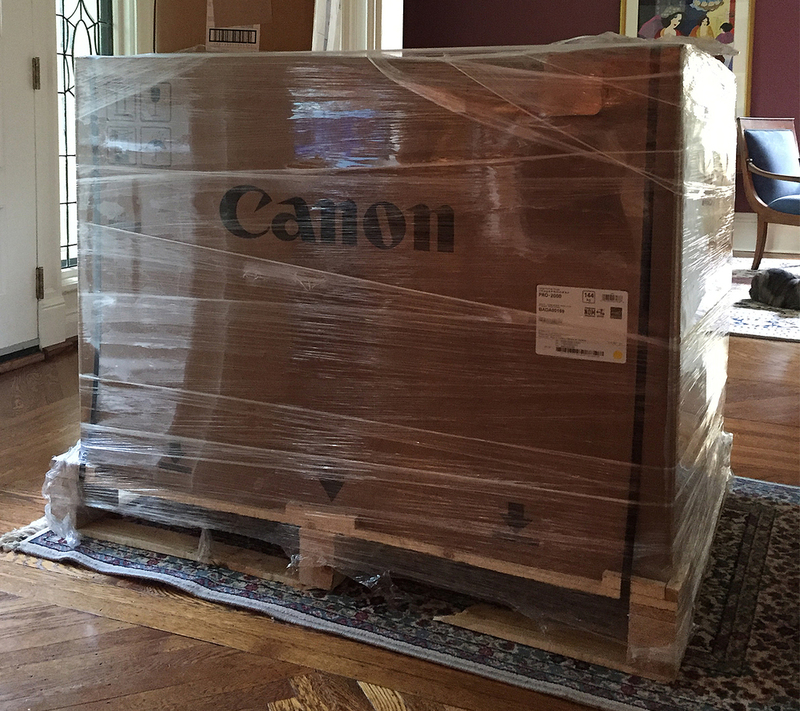 Canon ImagePrograf 2000, as delivered. For the next installment, in a few days, I will describe the unboxing and my impressions of the general build. Then I will take a bit of a break from the review process until I get the printer functional. Some months ago, I wrote several posts about the 'death' of my second Epson 7900 printer (and third 7900 printhead) and mentioned that I didn't think I could bring myself to purchase another Epson printer again. The pricing is such that if the printhead 'dies' you might as well spend just a very little bit more and get a whole new printer with a one year warranty, as opposed to the replacement head with a 30 day warranty. If you search the internet you will find that there seems to be a very clear problem with these printheads (which are used in the newest generation of Epson printers as well). These problems were not and will not be acknowledged by Epson. It was for this reason that I decided that my next printer would be a Canon (which has printheads that are user replaceable). At the time there were rumors of a new wide format Canon coming soon and that they would likely be very competitive in performance compared to the newest Epson printers based on the fact that they were an extension of the technology in the Canon ImagePrograf 1000 printer that had received very good reviews. I contacted Shades Of Paper, where I had purchased my prior three Epson printers, to see what I could find out. The purpose of this post is to tell you about a business where customers clearly come first! From the start the customer service was superb. I was able to get all the information I could ask for on both the new Epson and Canon printers. The Epson had already been announced and was available for purchase, while the new Canon was only a rumor. I was able to get a rough idea when the official announcement was anticipated; enough to know that it was worth waiting. As soon as there was any information available it was forwarded to me without my asking. Any questions were answered immediately via phone or within hours by email. We talked through the available options and decided that the Canon ImagePrograph 2000 wide format 24 inch printer would be the replacement for my Epson 7900. The point is that the customer service at Shades of Paper is second to none and the printer price I got was as low as any price I could find elsewhere. Even were the price a bit higher than their competitors (which it wasn't) it would be worth the extra for the customer service alone. I have purchased media from them in the past and their shipping is faster than 'the big boys'. I have no affiliation whatsoever with Shades of Paper. As they say, I am just a very satisfied customer. I highly recommend you give them a try. It might take a bit of time to get movers to bring it upstairs and get it all set up. When I do, I will let you know what I think of it. The Epson did produce great prints, but I simply can't put up with replacing it every two or three years for mechanical failure. If you have an inkjet printer you have inevitably had clogged nozzles. My experience has only been with Epson printers, and it certainly occurs with some frequency. The vast majority of times they are fixed with a cleaning cycle.....but sometimes you get a stubborn clog that just doesn't want to open up. Want to see a great video on how to declog that clog??? Of course you do! The video is put out by the Pro Digital Gear group and is quite well done and demonstrates exactly what you need to know. Sometimes things go contrary to what I had expected. With a bright and colorful flower like this Mum, I had expected the final image to be in color. 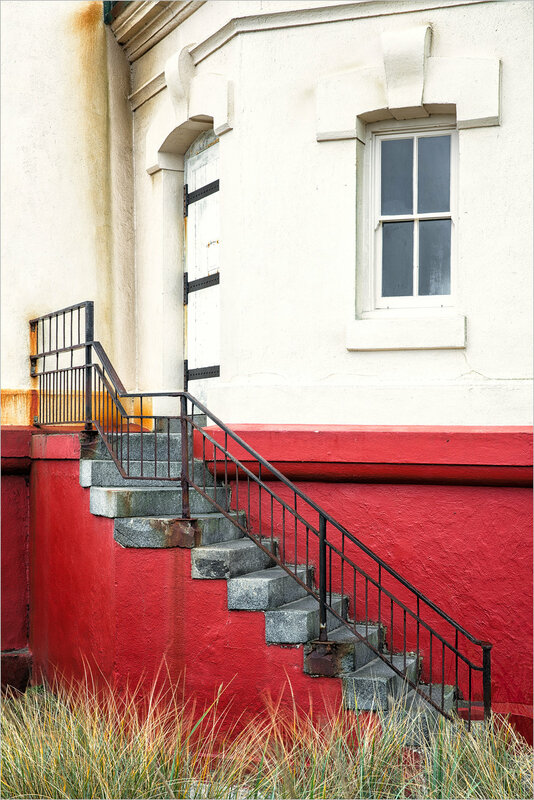 But as I processed the image, I realized that the photo was really more about shape and form than it was about color. Though I think both versions work, I personally prefer the black and white one. Producing both versions also gave me the opportunity to try black and white printing with Epson Hot Press Bright White paper, and, I have to say, the results are really exceptionally nice. Feel: The Epson paper has a nice rich, soft quality feel. However, despite being a slightly heavier weight paper than the Hahnemuhle if you go 'by the numbers', it doesn't seem to have quite as luxuriant a feel as Photo Rag. I believe this may be at least partially related to the fact that (at least to my eye) the Epson paper has slightly less surface texture with a smoother finish to it. Profiles: In my hands and with my calibrated monitor and an Epson 7900 printer, the Epson profiles seem quite good and work reasonably well with soft-proofing. To me they seem more accurate than the Hahnemuhle supplied Photo Rag profiles when compared to the actual output print. Of course, there are many variables involved with this statement and I can only describe what my experience has been. As they say, your mileage may vary! Optical Brighteners: The Epson paper is manufactured with the 'dreaded' optical brighteners. There are those that will not use papers with them because of concerns regarding fading over time. I am just stating the fact that OBAs are used and have no wish to get into that argument! Hahnemuhle Photo Rag also has optical brighteners, but these are kept to a minimum, at less than 0.1%, according to the Hahnemuhle website. I have seen the Epson paper described as having moderate amounts and suspect that it has significantly more than Photo Rag. Cost: B&H Photo has Hahnemuhle Photo Rag 8.5x11 inches, 25 sheets, 308 gsm (the closest equivalent to the Epson) for $39.31 and a 24"x39' roll for $166.75. The Epson Hot Press is $22.40 for the box of 25 and $104 for a 24" by 50' roll. So the Epson is significantly less expensive. But wait, there's more. Although the Epson is not advertised as a double sided paper, a bit of research shows that the production process places two finishing coats on the reverse and three on the front 'printable' side. Appearently, an Epson spokesperson has said that the non-printable side will not give as good a quality print as the side designated as printable. Perhaps true, but I really can't tell them apart very well so it seems to me the non-printable side can be used very nicely for proofing, creating even more value for the money. The Print: This is where the 'rubber meets the road'. I can only report what my eye sees. To me, it seems as if the Hot Press paper gives greater tonal separation and slightly improved sharpness and detail. The output is really nice, especially for a matte paper. If you hold the same print side by side with a glossy or semi-gloss paper like Ilford Gold Fiber Silk, you may well be disappointed. However, if they looked the same then it wouldn't be a matte paper. But for images that would be appropriate for the softer matte paper appearance, I don't think you can get much better (particularly for the value) than the relatvely new Epson papers. Although I have just tried the Hot Press Bright White, I now have an order in for the sampler pack so I can see and try out the Hot Press Natural as well as the Cold Press papers. Addenda: Between the time I wrote the above review and the time I published it, I rceived my sampler pack. While I can still say that I really like the Hot Press Bright White (which will become my new standard matte paper), the same is not true (for me) with the Cold Press and Hot and Cold Press Natural papers. The Cold Press, in my opinion, has a texture that is far too deep and symmetric. If the lighting on the image is straight on it looks ok, but for any angled lighting it looks like someone took a pizza wheel or a gear and rolled it over the paper in symmetric lines. To me, it just doesn't look right or 'natural'. The coloration of the Natural paper, both Hot and Cold Press, does not appeal to me either. It has too 'creamy' an appearance and in some light almost seems to impart a slightly yellow-green, as opposed to neutral, color. There is no question that paper choices are very individual and if these other papers didn't appeal to a large number of people then Epson would probably not be reselling them. So, take the above as my personal opinion.....but I am sticking with the Epson Hot Press Bright White, a paper that I find extremely attractive. In past posts I have documented the woes I have had with my Epson 7900 printer. The first one I had required a printhead replacement within the first two weeks of use and the machine ultimately died an untimely death of printhead failure about three years later (far too prematurely for a machine of this price), but not before I got to sink close to $700 into repairs that did not fix the problem. The repairs are criminally expensive, monopolied to one firm, and seem to follow a script of sequential and escalating repairs until the problem resolves, which is great if your machine is under warranty but, well, not so great if it isn't. Rather than throw good money after bad, I elected to stop at $700 when the next step (replacing the printhead) was going to cost over $1800 when labor was included, with only a 90 day guarantee. For little more I could buy a new machine with a one year guarante, which is what I did. Stupid, perhaps, but I went with another of the same printer thinking that the first was anomalous. The other day I ran across a great video on how Epson repair charges $300 for changing out a $13 part that literally takes 50 seconds to do. Even if you don't have a 7900, this video is worth the very brief watch if only to see the absurdity of it all. Now, if he would just tell us where one can purchase the $13 part! Watch this great video on the Epson 7900 wiper cleaner assembly change. The video looks like it is 'under construction' but if you just click the start button it plays. I embarked on a small 15 minute project that I thought might be worthwhile while I was reading Martin Evening's new book on Lightroom 4. In it he notes that the printer profiles that one utilizes in Lightroom and Photoshop for specific printers and papers typically automatically map the very dark tones to levels where the printer can produce detail (ie a level of say 1-5 would be mapped by the profile to a new level where the printer can generate a bit of detail by visually producing differences in the black tones). However, it is much more critical that one map the highlights to levels where the printer can produce detail, as profiles typically do not accomplish this very well. For example, 255 is pure white and any pixel at level 255 will print to paper white. This means that pixels at 254, 253, 252 etc SHOULD have some ink and that the levels SHOULD be able to be discerned from each other.....after all if you can't tell a 254 from a 253 then there will not be any ability to discern details or contrast in that region in the print. But the SHOULD is not reality and all printers are different. It seems it would be useful to know what level one's printer can start showing detail so that the brightest highlights with detail can be mapped to that level. So I did a brief experiment. I made a new file in Photoshop and with the marquee tool made multiple squares and then using the Edit>Fill command filled the squares with neutral colors at 255, 255, 255 and 254, 254, 254 and 253, 253, 253 etc all the way down to the upper 240s. My goal was to see where my printer started to produce printed patches that were able to be seen (thus, not printing paper white) and if one were able to denote differences between the patches (thus, denoting the ability to differentiate detail). Is this helpful information?? Maybe not groundbreaking , but I think it is helpful, Now I know that the brightest level in an image where I still want some ink and not paper white should be 251, 251, 251 or 252, 252, 252. Many books have advocated 248, 248, 248....but I think it helps to know how your particular printer acts and what it can do with the lighter tomes. Of course, I believe the results might only apply to the particular paper and profile that you are testing, but nonetheless I think this is useful information to have. I am using an Epson 7900 and would be interested in what types of results people get with other printers and if this is felt to be a worthwhile endeavor. About 2 1/2 years ago, when I first bought my Epson 7900 printer, I did a series of posts related to my unhappy initial experience with the output related to what appeared to be linear 'scuffing'. At that point, since the machine was only days to weeks old, it was still under warranty. After several 'house calls' by the service team the printhead was finally replaced, as nothing else seemed to do the trick. As soon as the printhead was replaced the machine worked perfectly and delivered beautiful output. I have to say that it wasn't as easy as it should have been to get the repair done because I wasn't using Epson paper and the service agents, over the phone, kept repeating that they could not warranty the machine for output onto non-Epson media, which was, of course, total nonsense. They finally agreed to service this brand new machine after I mailed them the output, including output on Epson media, showing that it occurred on their paper as well. Now, as I need the printer more than ever since : i) I am trying to finish the project I have alluded to in this blog several times and ii) it appears that a nearby institution might make a sizable purchase of my artwork.....I have discovered a problem. I noticed horizontal banding, mostly in the highlights limited to neutral coloration and when I print in black and white. Printing a gray square showed why. There is severe horizontal banding when I print gray/light black that is not present in other solid colors. A nozzle check revealed a small area of nozzle clogging in the Light Light Black ink. The clog would dissolve with regular and power cleanings, though even when open the line of the nozzle pattern 'stairstep' seemed light, and then some nozzles would drop out a minute later. A small fortune of ink and a maintenance tank later (related to power cleans) it still prints with gross horizontal banding. This persists even with two head alignments. i) When I look 'out there' on the internet it appears that this is a known problem with the 7900, specifically in the Light Light Black channel, possibly attributed to the chemical composition of the ink. It does not seem to happen in the other channels. It does not seem to be a simple 'clog', and my experience bears that out. Simple nozzle clogs are easily removed with the regular cleanings and don't recur within seconds. ii) Once Epson tech support recognizes that the machine is out of warranty, they do very little to help except set you up with a service visit. This too is well reported on the internet (with the realization that people don't usually take the time to post about good interactions in forums). iii) Epson has a service agreement with only one service company (they don't do the repairs themselves), so there is no competition. The cost, in this instance? The charge will be $100 for them to travel here (even though there is a local office), $175/ hour labor and they want to start by charging my credit card for $1712 (yes, you read that right) in parts to be shipped by Epson, with the caveat that they will refund the cost of parts they don't use. The whole printer cost $2500-3000 when I bought it. The repairs are rapidly approaching the cost of the printer itself and may even exceed it when you start counting in the price of the ink/tank used for the initial cleanings. This seems like highway robbery, but what else can one do except go along with it (or buy a new printer)!